because certain AA lithium batteries, in rare cases, may become extremely hot during usage in such products. Presumably they’ve had some problems with overheating flashes and have narrowed it down to particular batteries. They could have said “should not be used”, but obviously wanted to make a stronger statement. So what batteries should you use? Zinc-carbon batteries (non-rechargeable) are uncommon today. They’re outclassed in power and shelf-life by alkalines. Alkaline batteries (again non-rechargeable). These are great for devices like torches or remote controls, where they spend most of their time doing nothing, and are occasionally called on to supply some power. However in high-current devices such as digital cameras or flashes, they run out of puff very quickly. My recommendation: do not use in a flash unless you have no other option. Lithium (non-rechargeable). These have long shelf-life, but generally have no problems providing lots of current for those high-power devices. They’re not cheap though! NiCd (nickel-cadmium) rechargeables. These are popular in remote-control toys/models. They can supply lots of current to drive motors, but when idle will self-discharge fairly rapidly so need to be charged often. Careful recharging is needed to avoid a “memory effect” where the capacity of the battery gets smaller over time. NiMH (nickel-metal hydride) rechargeables. These don’t have the same memory effect issues as NiCd cells, which makes it easier to top them up before heading out with your flash. However they also self-discharge fairly rapidly, so you can’t leave fully-charged batteries in your camera bag and expect them to be full when you need them. In a camera flash being heavily used during an event (taking self-discharge out of the equation) NiMH cells will recharge the flash much quicker than alkalines, will last for more flashes before they’re empty, and can then be recharged instead of thrown out. Win, win, win! NiMH low-self-discharge (“LSD”) rechargeables. Essentially these have all the advantages of NiMH, without the problem of them going flat by themselves. Respected brands include the Sanyo/Panasonic Eneloop, and the PowerEx Imedion. The Apple-branded rechargeables seem to be rebadged Eneloops. The simple answer is that NiMH batteries (and especially the “LSD” variety) are what you should use in your flashes. Lithium batteries do have their place though, primarily for their long life and steady power output (the voltage doesn’t drop for a long time). For example they’re recommended by the manufacturers for use in some insulin pumps (for Type 1 diabetes): I use an Energizer Lithium Ultimate in mine. But they are expensive and at one stage a few years ago I instead bought a 4-pack of a supermarket’s own-brand Lithium AAs. The first one didn’t last quite as long as the batteries I had been using, and then on the second battery something strange happened in the middle of the night and the battery overheated: cooking the insulin in the pump and almost burning me. Ever since I’ve gone back to the Energizer Lithiums! 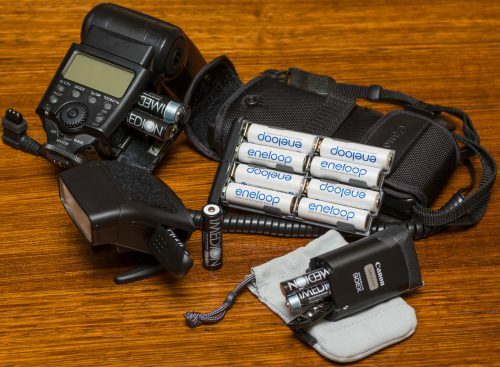 There aren’t standards to measure these batteries against so I can understand why Canon has made a blanket statement that Lithium AAs should not be used in their flashes. But at the same time it shouldn’t matter. We’re all using NiMH LSD batteries in our flashes aren’t we? In the above picture you can see my 580EX and the CP-E4 external pack which provides fast recharge and long life to the 580EX. In front is my 270EX II (a convenient slave unit I often use in macro work) which takes two AAs, and the tiny 90EX which takes AAAs. The 90EX makes an excellent wireless controller for cameras such as the 5D MkIII which don’t have an internal flash. As you can see, all these units are using NiMH “LSD” batteries. Our new 2015 photography workshop – Lord Howe Island!